This was a pretty hard cake. It was made for one of Rylee's little swim friends, Noah. Noah had his 2nd birthday party at Pump It Up (what a fun place!) so this cake seemed appropriate! 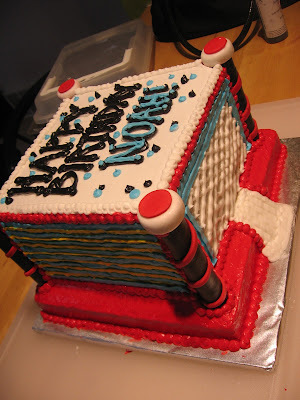 I got the idea for this cake from Cake Central, it's pretty genius! 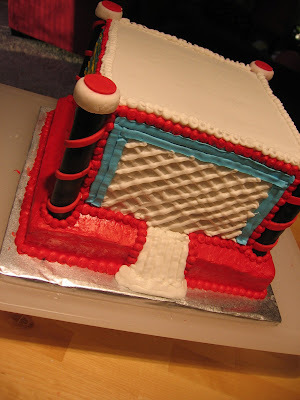 Everything is cake except for the posts which were made from Wilton plastic pillars, cut down to size and covered in fondant. The hardest part about this cake was icing the bottom "balloon" part, everything else was pretty easy. Happy Birthday Noah! Hi, Im thinking about making this cake for my kids' birthday party this coming week but I cannot find a recipe. I am not a baker my any means but I do enjoy trying my hand at new cake ideas. I just wouldnt know where to start. Any help would be appreciated.